They will know what is going on BEFORE arriving to the event. After all, they are running the event. They will know who the event coordinator is, and what their is for the event. They should also know who the VIPs in the event are. They know who the bride groom are and what is most important to them. If they are introducing the wedding party they should already have a list of names and be prepared to ask how to pronounce any that may be questionable. They should also request a list of events, and when they are happening before they arrive to the reception. People should know the name of who is speaking to them and what to expect from them throughout the evening. Making requests of wedding guests or announcements before doing so will diminish the respect of a Master of Ceremonies. A better one will take things a step further by introducing the venue to the guests as well...where to hang their coats, where the restroom is, etc. Regardless of how well spoken the one is, wrinkled pants or a stain on their shirt will be a negative distraction. A good MC should be one of best dressed at the event. There is a certain standard and expectation that the Master of Ceremonies sets by dressing well. It is important to be friendly to wedding guests on and off stage. After all, the guests should welcome his or her requests like, "Can you please be seated?" or "May I please have your attention?" Guests are more likely to respect a person who has the same warm personality on and off of microphone. Be prepared for the unexpected if and when it happens. The event can change based on unforeseen circumstances like the weather, wardrobe malfunctions, last minute wedding party changes, and a number of other things. Good MC's will usually to keep a pencil and paper handy to write down changes. One who uses index cards can simply fill out a new one with the information to add or replace one that is in your program. A good wedding band or DJ should be able to quickly adjust and play something appropriate to keep the of the event moving and interesting. Things can be easily misread or misprinted. The flexibility to improvise and and put add personality to the script goes a long way. Adding creativity to fit the moment goes a long way. Speech to the audience should be natural and not sound read. The caterer, photographer, video team, live band, and wedding Master of Ceremonies should all be on the same page. For example, if the the next announcement is "cake cutting," they should make sure that the caterer has knife and plate ready, photographer and video team are in place, and band is ready to strike up the cake cutting song before making the announcement. 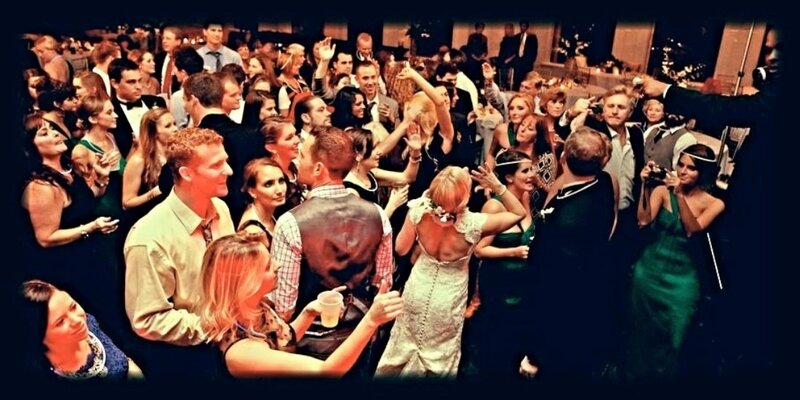 Hiring a band with an MC could cut down on the amount of wedding vendors that have to communicate with each other. They will be the life of the party. A wedding in itself is already exciting. With people who haven't seen each other in years, good friends of the family seeing a grand union, parents seeing one of the benefits of successfully raising their child, their spirits are usually high. A good Master of Ceremonies should accentuate the good feelings that are already there, and welcome the guests as well as hosts to celebrate! Do you need a wedding MC? Ours is FREE!